Why Are Labour’s Would-be Leaders So Right-wing? Why does a Labour party whose proclaimed raison d’etre is to offer a brave and radical alternative to current orthodoxy throw up would-be leaders who are clearly so reluctant to rock the boat? These are, after all, people who no doubt entered politics with lofty intentions. They would have felt concern – even righteous anger – at the Tory defence of privilege, the Tory contempt for the disadvantaged, the Tory neglect of what a decent society might look like. They would have been determined to do something about it. So when, and how, did that bright flame dim? Some critics will say that they are merely careerists who were never true believers and that their allegiance to Labour and its principles was only ever skin-deep, to be discarded as they got nearer the top of the greasy pole. But it is not as simple as that. I have no doubt that the impulses that took them into politics were good and true, and that their intentions were to act on those impulses so as to make a difference. But they discovered that noble impulses and good intentions are not enough, and are in any case easily displaced by apparently more pressing considerations. What takes people into politics is not just political conviction. Many people have strong political views, but practising politicians tend to be self-selecting on grounds of temperament. These are the people who want to see their ideas carried into practice and who have the ambition and self-confidence to believe that they are the people do it. But when they get to Westminster, they discover that the team game – one side against another, Labour against Tory – is only part of the story. There is also a whole series of individual contests, as the more able begin to distinguish themselves, and the possibility of influencing, even eventually leading, one’s party becomes apparent. The skills that the Westminster arena requires are not necessarily those of commitment and consistency, innovation and courage. They are those of the debater and speaker, the media performer and glad-hander. The minutiae of politics, rather than the clarity and strength of vision, become increasingly important in determining who is up and who is down. And the day-by-day requirements of Westminster become more and more pressing and absorbing. Our leading MPs work very hard; they put in long hours, spinning from one difficult topic to another at often half-hourly intervals. It is not surprising that the hand-to-hand, close-quarters combat across party lines takes virtually all of their attention, and they find it easy to persuade themselves that they must be fighting the good fight because they are so busy. The influences brought to bear on them as they become more senior and more influential are equally short-term. The focus is on the latest newspaper headline or television interview. And, as they are drawn into the party’s higher councils, they are made privy to the findings of the pollsters, each nuance of which is given great weight. The polls are treated, not as a snapshot of opinion at a given moment, but as signposts to future action that can be ignored only at one’s peril. So they will, in the case of Labour politicians, tell them that Labour is not trusted on the economy; this is seen as immediately requiring redoubled efforts to assure voters that Labour will be prudent and responsible – prudent and responsible, that is, as seen in the context of the current orthodoxy. The way to win, it is accepted, is to find out what people think, and then frame policies accordingly – to follow rather than lead. An attempt to change the way people think is doomed to failure. The best that can be done is to follow the much-admired Clintonian “triangulation”. The original impulses and intentions are taken as a given and are rarely reviewed. They are submerged by the new imperatives – to perform well, to get good notices, to raise one’s standing in the eyes of one’s colleagues. As to actual analysis and policy, there is no time – and even less incentive – to go beyond an increasingly automatic recital of vague objectives that are disconnected from any of the hard work and thinking that would be required if orthodoxy is to be effectively challenged. And that is in any case unlikely. Today’s generation of leaders were brought up in a world where voters were consumers rather than citizens, where the market would deliver better outcomes than could be expected of public provision, where running a country was best done according to business principles and where spending and borrowing in the public interest was dangerously irresponsible and imprudent. Today’s leaders, in other words, are totally ill-equipped to advance any persuasive account of how they could run the economy better so as to deliver the commendable objectives that took them into politics in the first place. They are still capable of reciting the old catechisms about social justice and helping the disadvantaged but are at a loss as to how these are to be achieved – largely because, in their heart of hearts, whether they know it or not, they accept so much of the Tory analysis and agenda. Labour’s would-be leaders have never done the hard work needed to mount a proper challenge to the neo-liberal hegemony. That is why, for example, when Labour entered the last election prioritising a commitment to eliminate the deficit, most of those who endorsed that commitment had no idea which deficit – the country’s or the government’s – they were actually talking about and why it was in any case entirely beside the point if we are seeking a well-performing economy that serves the interests of the great majority of voters. And yet the SNP managed to successfully mount that challenge and win 56 of 59 seats. And they did it by, in the words of SNP leader Nicola Sturgeon, “acting more like people expect a Labour Party to act”. Meanwhile, prospective UK Labour Party leaders are already rejecting any co-operation with the SNP post 2020! All this as the Labour Party in Scotland is being, quite reasonably, pronounced as dead. I personally very much doubt they will make much of an impact in next year’s Holyrood elections. 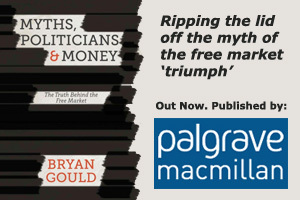 Bryan, I have purchased a copy of your book ‘Myths,Politicians, and Money” and you didn’t mention in it, anything about the about the use of credit from the Reserve Bank in the 1930’s. I believe that until the Labour party decides to utilize Reserve Bank credit again, and stop following blindly down the same path as the National Party, it is domed to stay in the political wilderness, or even extinction! I believe Reserve Bank credit was being used by both parties until the early 1970’s. At present the only souce of overseas funds is the Agriculture Pastural Industries. At the rate this government – National – is selling our assets, even this will be lost very shortly. I believe the party has to come out strongly opposing TPPA, and mean it. As a member of the parties policy committee, I belive you are in a very strong position to bring about possitive change. Well said Ken on all of the points you raise. We need our own money supply back again. I think it is more than obvious since 1984, that funding for party advertising and media support depends on the leaders, and party, being Tory lite. Good analysis Bryan. I am sure you are aware that the NZ Labour Party has a similar problem, even though the membership did recently elect the most “left leaning” candidate available as their new leader. But, that was the grass-roots membership (thank God! ), NOT the Labour MPs, the majority of whom are far too right wing. I will not name names here, we all know who they are, and there are far too many of them in the NZ Labour caucus, and THAT, to put it brutally frankly, is the core problem of the NZ Labour Party. There are many reasons for this, including that NZ Labour still refuses to totally face up to the disaster of Rogernomics, and to totally repudiate Rogernomics and neoliberalim. Still trying to have one’s cake and eat it too regarding neoliberalism is crippling the NZ Labour Party. There are MANY good people in the party, battling to remedy this, but we are continually blocked by the majority of the caucus.